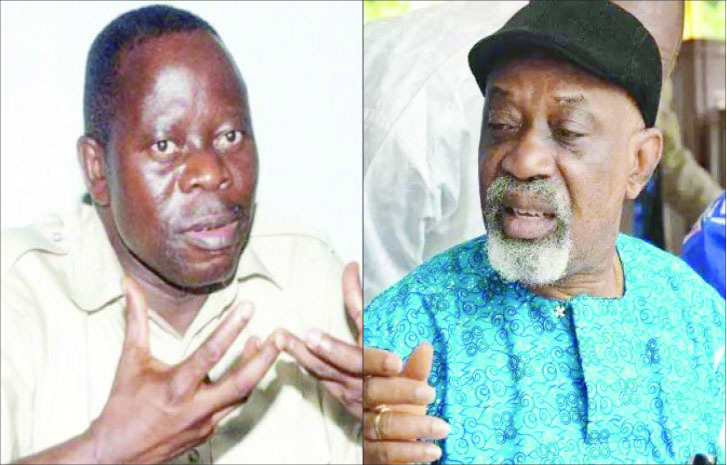 Chairman of the All Progressives Congress (APC), Adams Oshiomhole, has threatened to sack Chris Ngige, the Minister of Labour and Employment, from the party, Premium Times report. Mr Oshiomhole is having a running battle with Mr Ngige over the refusal of the minister to inaugurate boards of parastatals under his ministry, several months after they were appointed by President Muhammadu Buhari. Mr Oshiomhole had written to Mr Ngige asking him to inaugurate all board members appointed under his ministry. Mr Ngige, however, replied and stated that he had inaugurated three boards in the ministry but would not be in a hurry to inaugurate that of Nigeria Social Insurance Trust Fund (NSITF), because of an alleged N40 billion corruption scandal by the former board. He said he has resolved to return to internal discipline to the APC. “For me it is the height of mischief for any minister, you cannot purport to be an honourable minister and you act dishonourably and nobody is greater than the party. “And if the President condones disrespect for his office, I will not condone disrespect for the party. And when we expel the minister we will prevail on the president that he can’t keep him in his cabinet; people who have neither respect for his own decisions nor have respect for the party without which they would not have been ministers,” he said. He said the decision not to inaugurate the boards amounts to a disrespect for the office of the president by all the ministers that are yet to inaugurate board members under their ministries. Apart from Mr Ngige, Minister of State (Aviation), Hadi Sirika, is also yet to inaugurate some boards under his ministry. “it is the same green pen that made them ministers that appointed these boards that they are refusing to swear in. And it is absolutely illegal for a minister in a democracy to prey on the powers of the board because the laws establishing those institutions are clear, that the boards have procedures to follow. “So, when a minister sits in his office to appropriate the powers of the board in a democracy, not in a dictatorship, award contracts that didn’t go through boards, those are clearly abuse of office for which they are liable. “I am convinced that what they are doing is not with the endorsement of Mr. President. Over the period they have tried to drop the president’s name but I tell them it is the same authority that appoint these people. “If they did that in the past, under our leadership we will not tolerate it. They either comply or we will expel them from the party. When we expel them we will find out how a government can keep a rebel in the cabinet. There is no question about that,” he said.